Year after year since the 1990’s, the Philippines participates in the worldwide celebration of Earth Day. The Philippines’ celebration is unique in that it is a coming together of government, civil society, and churches to highlight the country’s environmental health and renew their partnership to work for the common good. Since 1999, the partnership has evolved into a loose coalition called Earth Day Network Philippines (EDNPI) with a Secretariat that directly coordinates the Network’s members from local government units to non-governmental organizations, from business corporations to churches and academic institutions, and from big organizations to individuals who want to do something for the environment. Through Presidential Proclamations, Earth Day has become a permanent environmental holiday of the country and has become a fixture in the national environmental consciousness. This time For 2014, the children and Earth Day celebration gives focus to CLIMATE CHANGE. This year is special because this time there will be a run for the children which will not only help them in their physique but also for them to be a lover and in their early days learn and be a part of this kind of advocacy for the mother earth, its important because we have just experienced the onslaught of Super Typhoon Yolanda, which almost brought all our brothers and sisters in the Visayas and Northern Palawan down to their knees. More of these super typhoons are expected to come as a result of human-induced climate change. Aside from the above mentioned, 2014 is also equally important for the Network because it is celebrating its 15th anniversary. It was in 1999 that Mr. Mark Dubois of Earth Day International visited the Philippines and helped form the Earth Day Network Philippines in the house of the late Odette Alcantara, the founding Country Coordinator. Since then, the celebration of Earth Day has become truly a dynamic celebration with a meaningful Main Event held in different areas of the country to highlight that Earth Day is Everyday, Everywhere for Everyone. This year’s celebration involves the holding of the “PRO-EARTH RUN” to formally launch and highlight the Earth Day 2014 Celebration and to mobilize resources to support the continuing advocacies of EDNPI on climate change and the conservation of the country’s biodiversity resources. 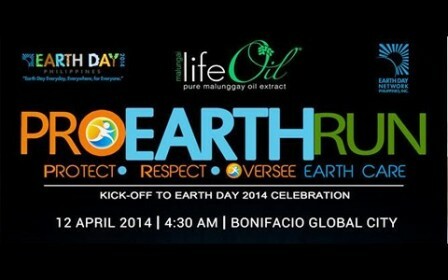 The Earth Day Network Philippines’ PRO EARTH RUN is presented by Manila Nature’s Link Corporation’s Malungai Life Oil (www.malungailifeoil.ph), a proudly Philippine-made all-natural concentrated vegetable extract noted by the Johns Hopkins University as the world’s first and only product developed from pure Moringa Oliefera seeds and leaves, and the United Parcel Services or UPS. 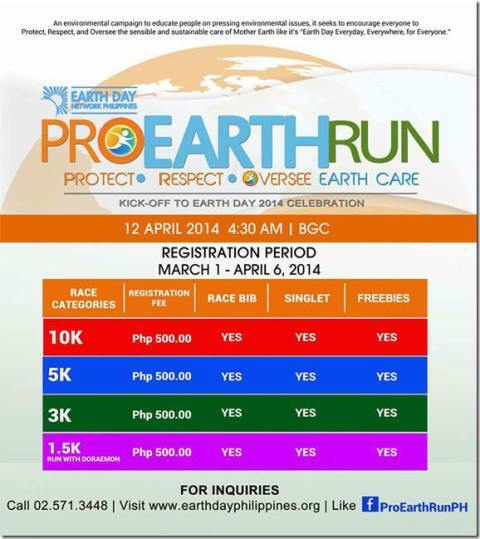 The PRO EARTH RUN is also supported by First Gen, Philippine Charity Sweepstakes, Merrell – ProEarthRun’s shoe sponsor, St. Luke’s Medical Center – ProEarthRun’s medical partner, Greenlite Banner – ProEarthRun’s official printing partner, Globe, Holcim, The Body Shop, Coco Dolce, Business Mirror, The Manila Times, Malaya Business Insight, BusinessWorld, Circuit Magazine, 106.7 Energy FM, 107.5 WIN Radio, SM Tickets, SM Cinema, and the BGC. The culmination of the celebration will be during the Earth Day 2014 Main Event. To be celebrated at the Quezon Memorial Circle, there is where we will be highlighting the network members’ efforts and achievements for the past year. The Main Event is also the occasion wherein the DENR Secretaries have presented the State of the Philippine Environment Address annually. Together with the Main Event is the SANDIWANG: Isang Diwa sa Pagdiriwang ng Kalikasan, an Interfaith Celebration of Earth Day that we intend to be a more artistic and cultural celebration. Also in line is the Earth Day 2014 Advocacy Fair, where individuals can learn more on how they can participate or volunteer in the specific advocacies, programs, and projects of different organizations, national government agencies, and local government units. For more information, you may contact EDNP Secretariat’s Network Relations Officer, Mr. Ryan Alfred Go, at Telefax: (02) 332-6030; Mobile: 0905-5051111; or Email: secretariat@earthdayphilippines.org.